On Thursday, Watford held the End of Season dinner. I must say that I don’t enjoy Wembley as a venue, it feels as though you are having dinner in an aircraft hangar and the event has lost its friendly feel. On the plus side, for the first time in three years the head coach was in attendance. I managed to have a brief chat with Javi, who said what a lovely family we were at Watford. On the family theme, it was really lovely to see Rita Taylor there with her daughter and grandchildren. The youngsters were on the stage to help present the Player of the Season award which is named in honour of GT. 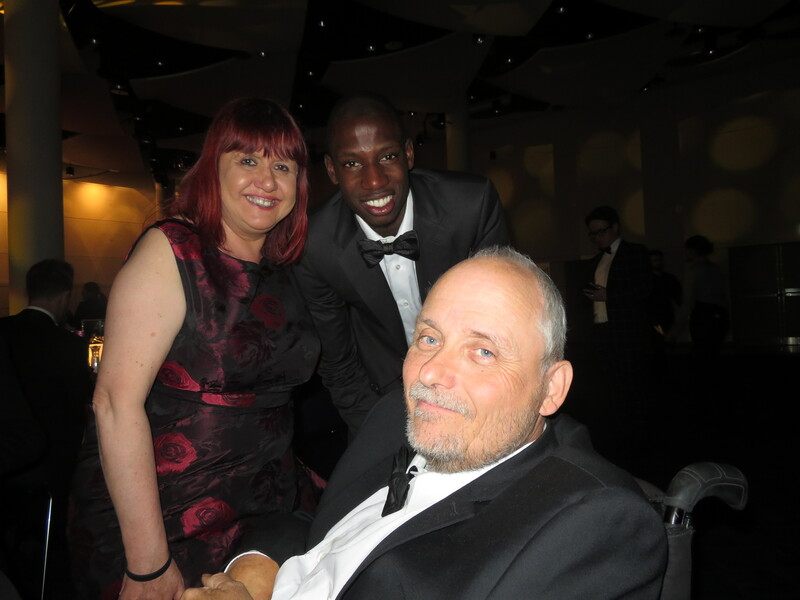 There was no surprise when Doucouré won the award and I can confirm that he is a lovely chap. As, indeed, is Christian Kabasele, who was the Community Ambassador of the year. The Hall of Fame inductee was Tom Walley, not before time. He was joined on the evening by a number of his ‘graduates’. Robert Page and Kenny Jackett both paid warm tribute to him and his part in making them into the players/managers/men that they are. Tom’s acceptance speech was brief but heartfelt. 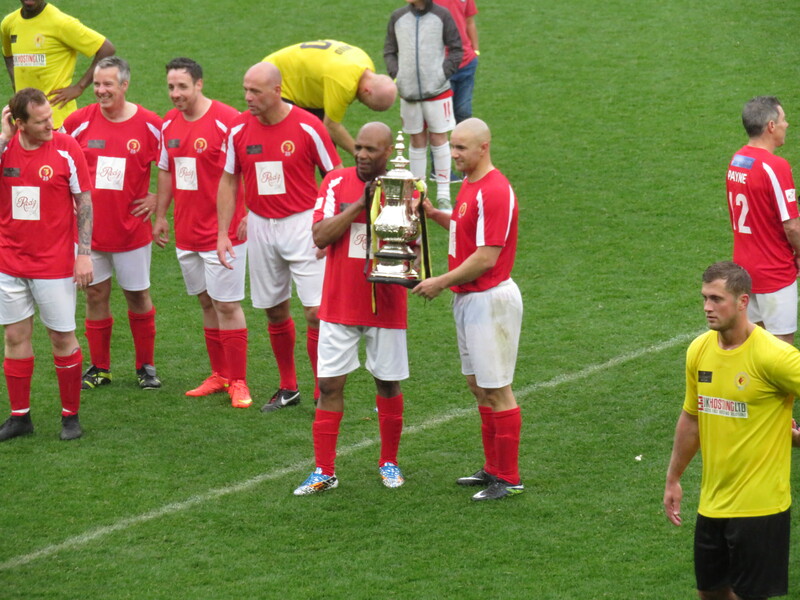 On Saturday was the Legends game in aid of the 25th anniversary of the Community Sports and Education Trust. It was a foul day with the rain lashing down but, as I entered the ground, I was cheered to see Tom Walley waiting for the lift to the concourse. I went up to him to say how happy I was that he had received the Hall of Fame accolade. I was rewarded with a smile, a kiss and “Football has been good to me.” I pointed out that he had been very good to football. The game ranged from the sublime to the ridiculous. But it was lovely to see Lloyd Doyley, Nicky Wright, Allan Smart, Steve Palmer, Gavin Mahon, Marcus Gayle and Derek Payne gracing the Vicarage Road pitch again. The teams were managed by Luther Blissett and Kenny Jackett. Luther played a cameo at the end and ended up as the manager of the winning team. After the Legends game, I headed up to Manchester for Sunday’s match. When I arrived at the pre-match pub there was already a couple of Northern based Hornets at ‘our’ table. The team usually travel to the ground from the hotel opposite the pub, so we waved them off from the comfort of our seats. Not that they saw us, but it is the thought that counts. 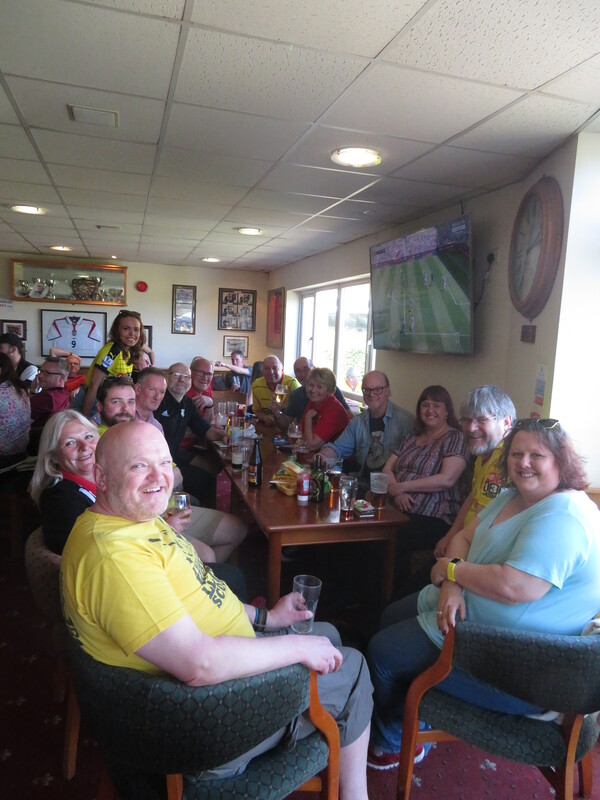 Our pre-match group was honoured to be joined by Emma Saunders, Watford’s matchday announcer, who was being a fan for the day. We left the pub in plenty of time to deal with the extensive security measures that are always in place at Old Trafford. Being aware of the restrictions, I had left my rucksack and laptop in the hotel and arrived at the ground with only my essentials. We passed through the first cordon and had our bags checked with no issues. Then we arrived at the next phalanx of stewards to be told that no bags were allowed in the ground “because of what happened in Paris last night.” So, a madman with a knife on the streets of Paris meant that middle-aged women could no longer be trusted to bring handbags into a football stadium. Mick Smithers, our Police liaison officer, was in the vicinity, so we asked whether he would mind our bags, but we were given no choice but to walk to a car park across the road to dispose of the offending items. The bag drop that had been designated for away fans was already full. We asked what we were supposed to do now and were directed to another portacabin that was barely visible in the distance. On arrival, I emptied my bag of most of its contents and transferred them to my pockets and basically left my make-up bag behind. When we arrived back at the turnstiles, there was a quick check with a wand and we were in. It would have been a lot simpler and more secure to have examined the contents of my small bag as they had no idea what was in my rather large pockets. Due to our diversion, I arrived at my seat just as the pre-match handshakes were taking place. I then did my usual thing of getting my notebook, pen and camera ready for the game. As I retrieved things from my coat pocket, I realised that I had completely forgotten to transfer a pen from my bag and nobody else in our party had one, so I was unable to make any notes on the game, which is probably as well as it was not a game packed with incident. Team news was that Gracia had made three changes from the Newcastle game with Gomes, Deulofeu and Richarlison coming in for Karnezis, Capoue and Deeney. So the starting line-up was Gomes; Janmaat, Cathcart, Kabasele, Holebas; Doucouré, Hughes; Deulofeu, Pereyra, Richarlison; Gray. 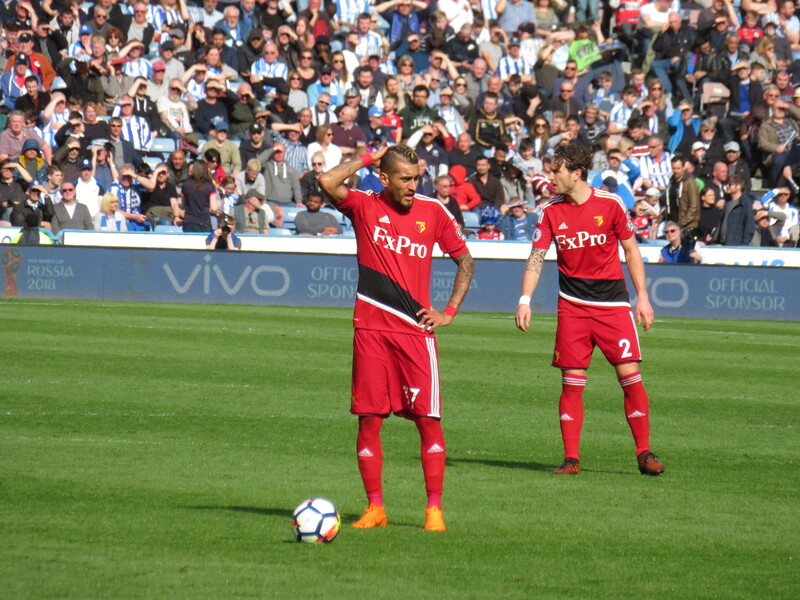 The return of Gomes to the team meant that he would make his 100th Premier League appearance for the Hornets and would be wearing the captain’s armband as he did so. There was also much joy among the travelling fans when it was confirmed that Chalobah would be on the bench after so long out due to injury. 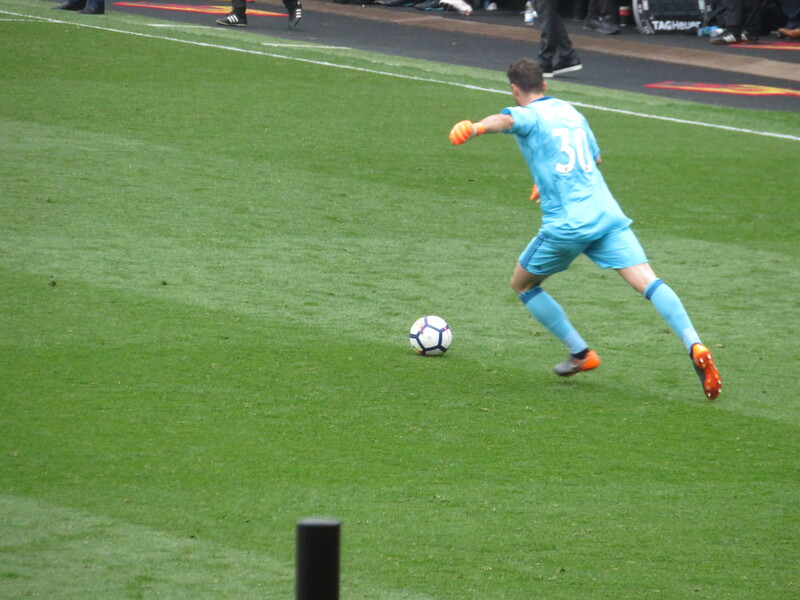 The first chance of the game fell to the Hornets as Romero dropped a cross from Janmaat which, for a moment, looked as though it may drift in to the goal, but there was no Watford player on hand to take advantage and the United goalie was able to recover. The first caution was earned by Rojo for a foul on Richarlison. The young Brazilian took the resultant free kick himself but sent it well over the bar. The home side had their first chance of note in the 16th minute when Sanchez received a pass from Blind, but volleyed well wide of the target. Gracia was forced into an early substitution when Kabasele ushered a ball out of play and, as he followed it, the momentum took him down the slope behind the goal and he collided with the hoardings. 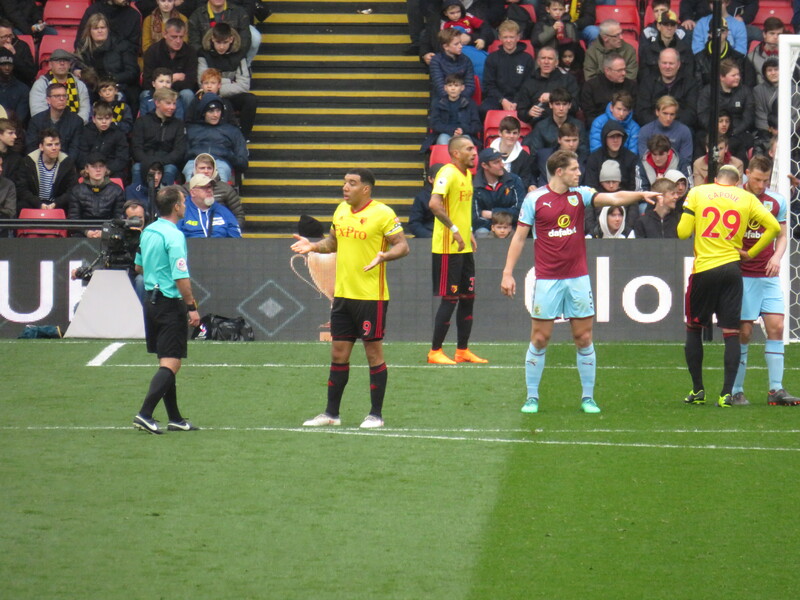 Christian tried to continue after receiving treatment, but soon had to be replaced by Mariappa. I was just hoping that this didn’t end his chance of being involved in the World Cup. United took the lead in the 34th minute with a goal that came out of nothing as Carrick played a ball over the top to Mata, who appeared to be in an offside position, he squared for Rashford who had a simple finish past Gomes. 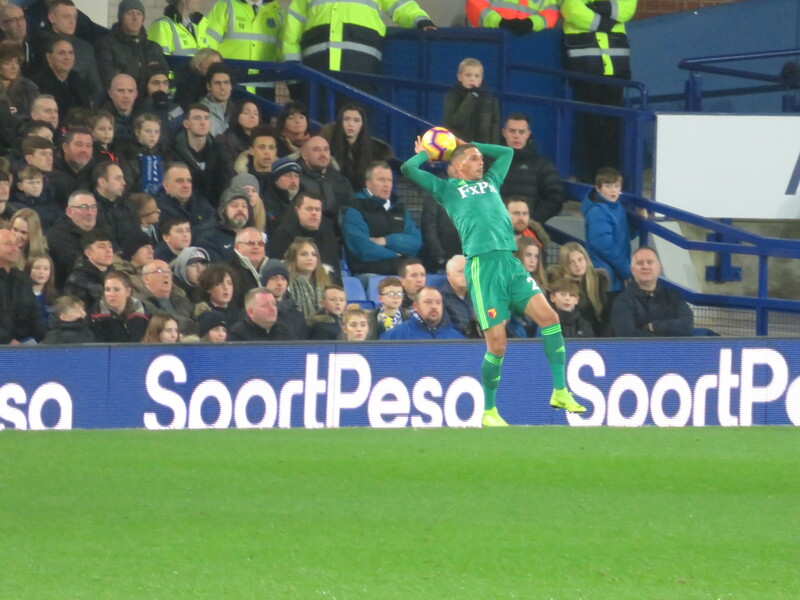 The Hornets should have grabbed an equaliser just before half time as Richarlison met a cross from Janmaat and headed back across goal, but Romero pulled off a terrific save to frustrate the Watford youngster. 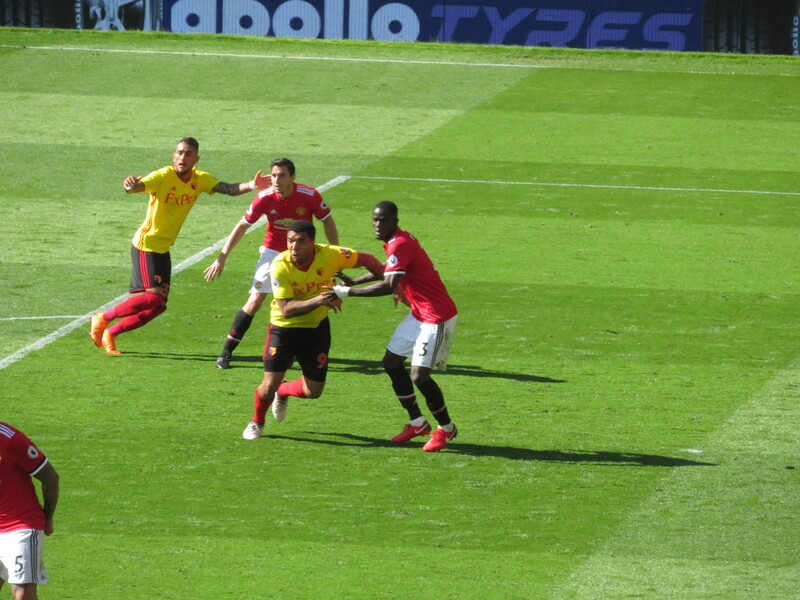 The resulting corner reached Deulofeu who tried a shot, but Romero was also equal to that effort. So we reached half time with the Hornets slightly unfortunate to be a goal down. The first incident of note in the second half was a caution for Ashley Young after a foul on Janmaat. Sadly, following his unpleasant celebration after scoring against the Hornets at Vicarage Road, the former Watford youngster was being booed every time he touched the ball. 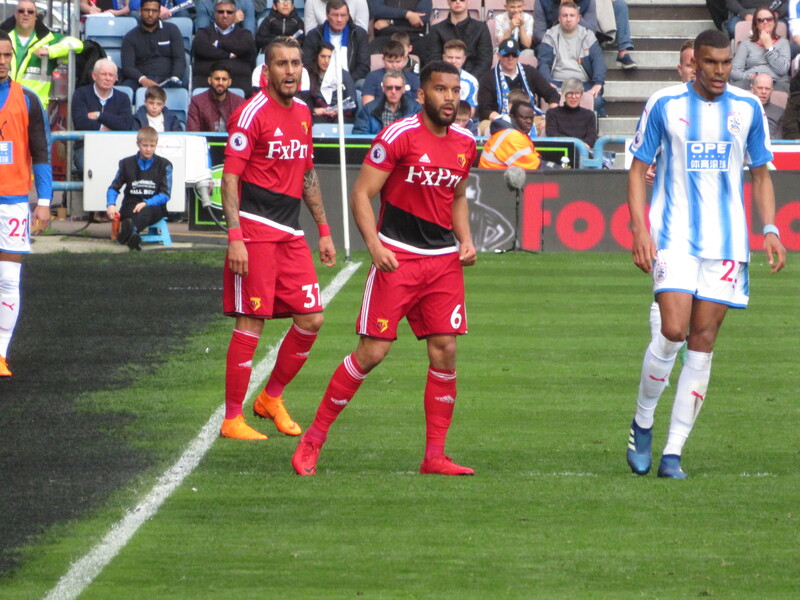 Pereyra took the free-kick, which bounced off Mariappa and the home defence were able to clear. Soon after, Young was replaced by Luke Shaw. Gracia also made a change bringing Deeney on for Deulofeu and switching to two up front. United had a chance to increase their lead as Sanchez crossed to the back post, but the ball was too high for Mata. There was another card for the home side as McTominay was penalised for a shirt pull on Richarlison. There appeared to be a terrific chance for the Hornets as a poor clearance bounced off Hughes who found Gray, who had a great chance to finish but took one touch too many and ended up putting the ball wide. His blushes were spared as the flag was up for offside, but it was a terrible miss. There were loud cheers from the travelling Hornets as Chalobah appeared on the touchline ready to take the field, which he did in place of Gray. United then made their second substitution bringing Herrera on for Blind. With 10 minutes remaining, Watford had a terrific chance to score an equaliser as Richarlison ran into the box but, again, waited too long to take a shot and was tackled. 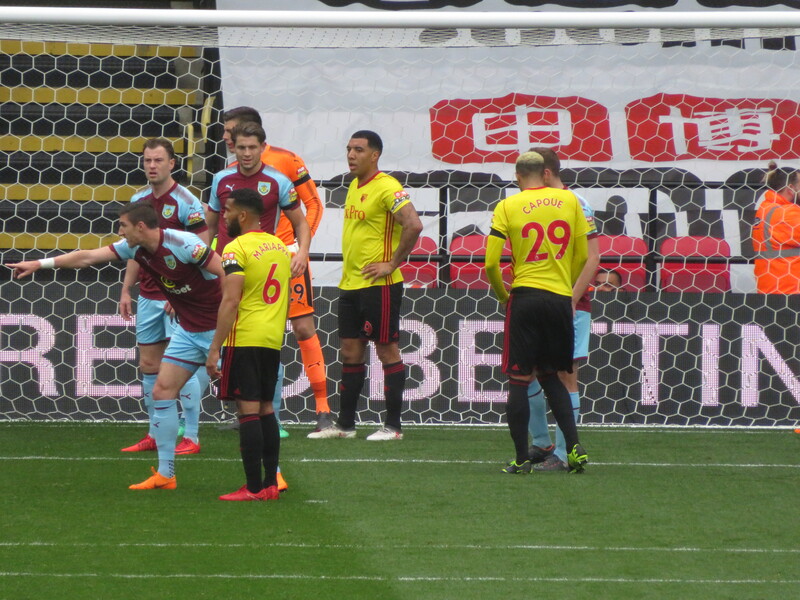 The last half chance for the visitors came as a deep corner from Holebas was met by a header by Doucouré, but it was weak and easily gathered by Romero. With five minutes remaining, Michael Carrick, who was making his last appearance before retiring, was substituted (for Paul Pogba) to allow him to enjoy an ovation from the United fans. 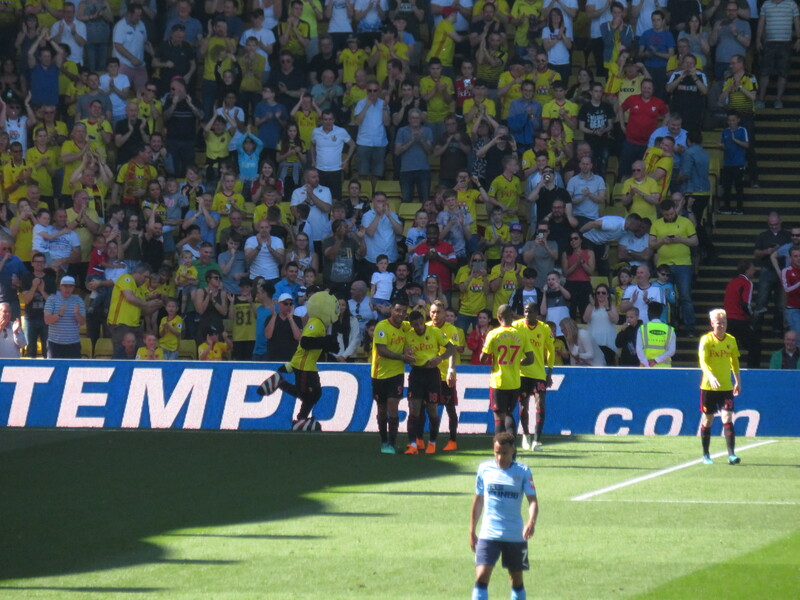 The Watford faithful joined in with the applause. And that was it, there were no further goals and the game finished with a narrow win for United. 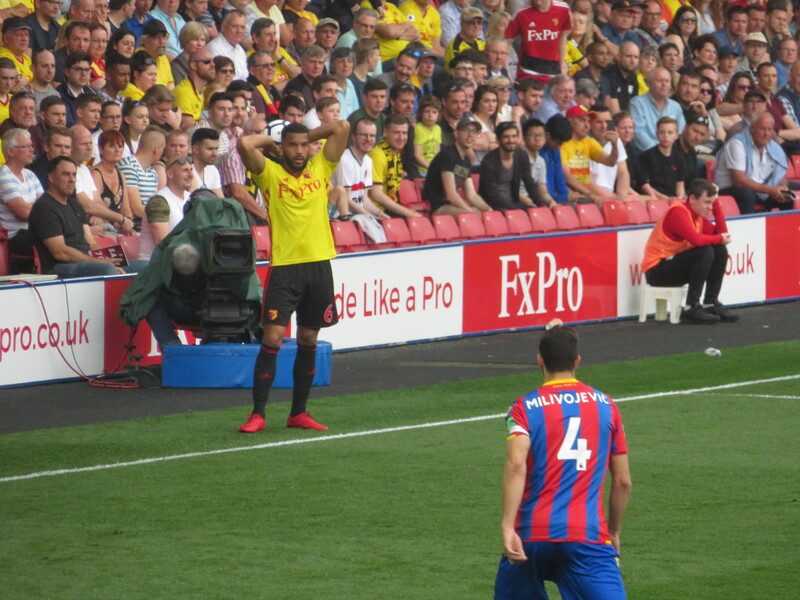 At the final whistle, the Watford players applauded the crowd and Adrian Mariappa came over to give his shirt to one of the fans in the disabled area. The stewards on the pitch stepped in to stop him and it took all of his charm to persuade them that this action was not a security issue. The joy on the face of the woman who received the shirt as she held it aloft in triumph made the stewards’ action look as mean spirited as it was. It was also noticeable how few home fans were left in the ground to applaud their team’s efforts this season. I guess that finishing second in the league getting to the Cup Final isn’t worthy of celebration in this part of Manchester, nor is saying goodbye to a long serving player. So very sad, but Old Trafford seems primarily to be a tourist destination these days. As we headed back to pick up our bags, I encountered Don Fraser, so pushed his wheelchair back to Coach 1. We proceeded in the direction of the bag drop only to find that there was a barrier in the way and a steward directing us back the way we had come. Our expressions of indignation persuaded him to let us through and, thankfully, we were soon on our way. So it was back to the pub for the last post-match analysis of the season. It has to be said that it wasn’t a great game. The home side appeared to be playing in second gear while they looked forward to the Cup Final next week. 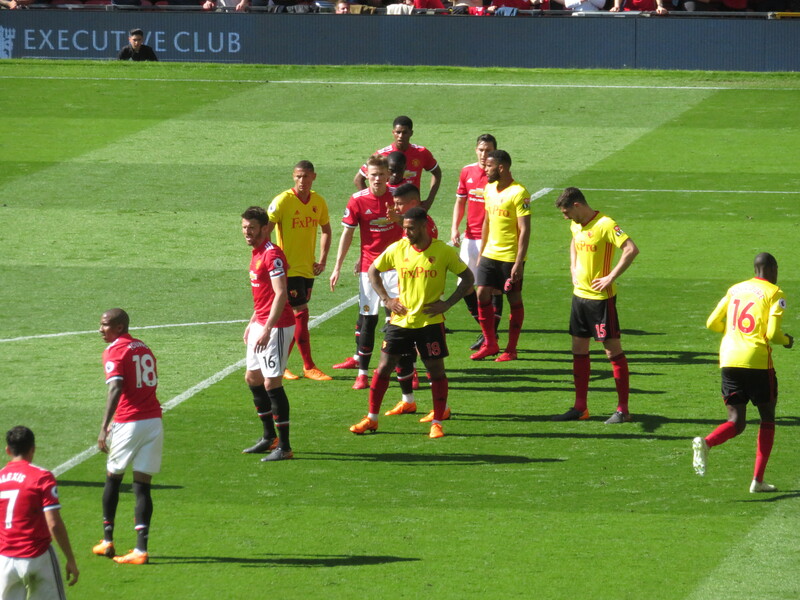 Watford, as so often this season, put in a decent performance but, as a friend commented, were “pathologically opposed to shooting.” United did defend well, but if an early shot had been taken on a couple of occasions, Romero may have had a more difficult afternoon. It has been a very odd season. It started with some superb performances, but started petering out once Silva received the approach from Everton and, despite moments of brilliance, never regained any momentum. While 14th in the division is something that most of us would have been happy with at the start of the season, it does feel like the team has massively underachieved given the talent in the squad. Certainly the absence of Cleverley and Chalobah through injury for much of the season has had an effect on performances, but the main problem has been the lack of an effective striker and they are not easy to come by. But, frustrating as this season has been, I will be counting the days until the fixtures come out so that I can plan next year’s adventures. Thank you to all of you who have read my reports this season. I wish you all a wonderful Summer. 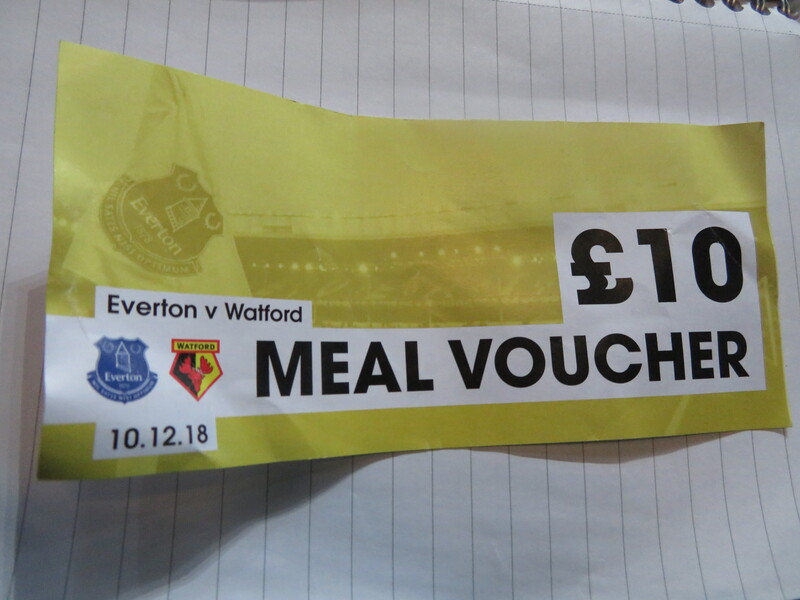 This entry was posted in Watford FC and tagged Abdoulaye Doucoure, Adrian Mariappa, Alexis Sanchez, Ander Herrera, Andre Gray, Ashley Young, Christian Kabasele, Craig Cathcart, Daley Blind, Daryl Janmaat, Eric Bailly, Gerard Deulofeu, Heurelho Gomes, Javi Gracia, Jose Holebas, Jose Mourinho, Juan Mata, Luke Shaw, Manchester United FC, Marcos Rojo, Marcus Rashford, Matteo Darmian, Michael Carrick, Nathaniel Chalobah, Paul Pogba, Richarlison, Roberto Pereyra, Scott McTominay, Sergio Romero, Troy Deeney, Watford FC, Will Hughes on May 14, 2018 by franelynn. Monday’s game against Spurs was a very odd experience. Going to Wembley for a normal league game just didn’t seem right. The crowd looked very sparse despite there being over 52,000 there. Unlike normal away games, the concourse pre-match was very quiet indeed. 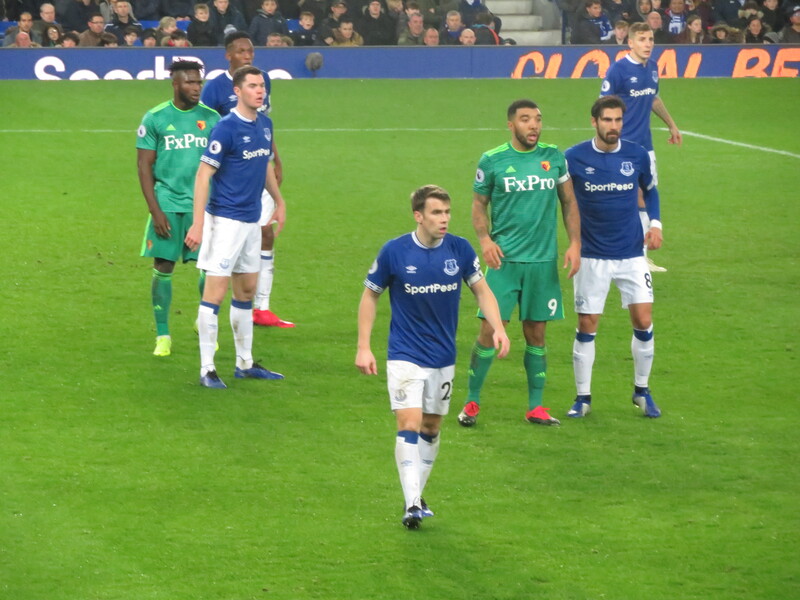 As for the match, the Hornets put in a very decent performance but, as so often this season, made a couple of mistakes at the back and failed to make the most of their attacking chances, so ended the game on the end of a 2-0 defeat. One that wasn’t unexpected, so didn’t leave me too dispirited. It was lovely to be back at Vicarage Road for the last home game of the season. Unusually for a bank holiday weekend, the sun was shining brightly. There was a great turn out in the West Herts. The call had gone out that there would be a game of Soccer Dice. Boys versus Girls in the ToddDee challenge. Fittingly, Toddy’s son, Chris was in attendance and enthusiastically joined in. Soccer Dice is a simple game as you throw a set of dice, one at a time, following the instructions until a goal or a miss is thrown. This may sound like quite a sedate pastime but, as it always does, it quickly descended into rowdiness and accusations of cheating. The boys won 9-6, but I suspect there were some nefarious activities involved in that victory. 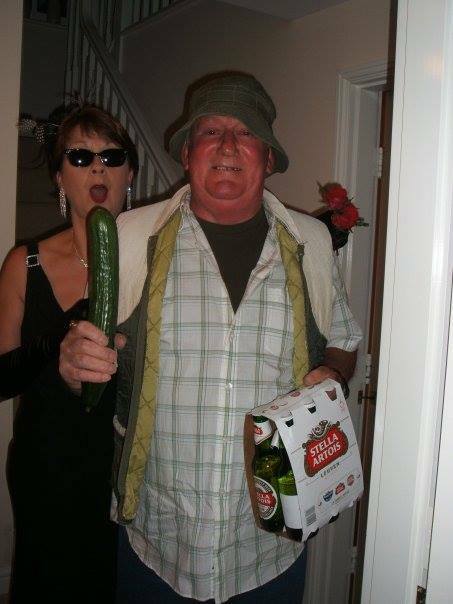 Dee and Toddy would have both loved it. The crowd on the way down Occupation Road seemed larger than usual and there was a tremendous atmosphere. As usual, I bought my programme from the woman just inside the Rookery concourse and wished her a happy close season. Then to my usual seat for the last time until August. There was a flag just along from me that wasn’t being used, so I took possession and waved it. I then realised why I don’t usually try as I am so cack-handed that the guys in the row in front appeared to be under attack. Thankfully, they were uninjured in the process. Team news was three changes from Monday with Janmaat, Pereyra and Deeney coming in for Mariappa, Femenía and Richarlison. 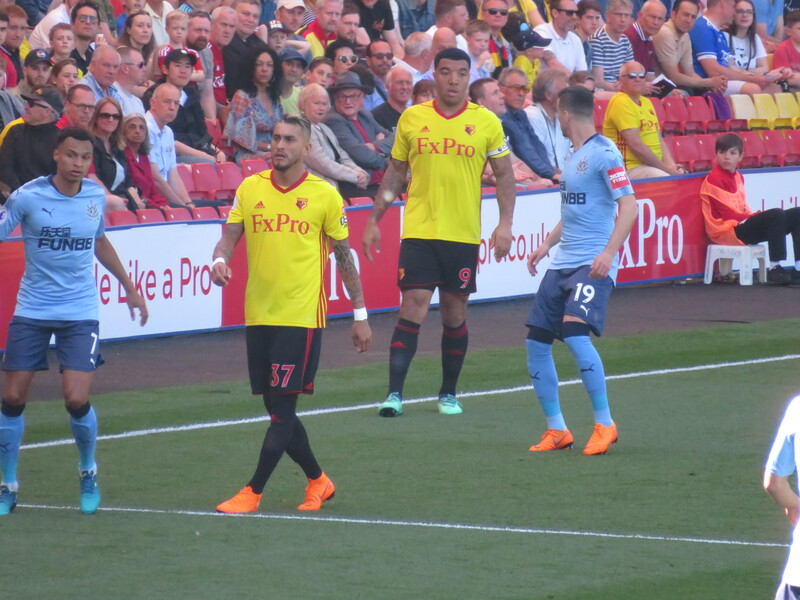 So the starting line-up was Karnezis; Janmaat, Cathcart, Kabasele, Holebas; Hughes, Doucouré, Capoue, Pereyra; Deeney and Gray, lining up in a 4-4-2 formation, much to the joy of many Watford fans. After our recent run of results, and knowing that we could do with the points to make absolutely sure of safety, I went into this game feeling rather tense. The game kicked off and, thankfully, the team were not as nervous as I was and started quite brilliantly with Deeney and Gray combining before finding Doucouré who played a lovely square ball to Pereyra, who finished from close range. 1-0 up after two minutes in glorious sunshine and all felt right with the world. 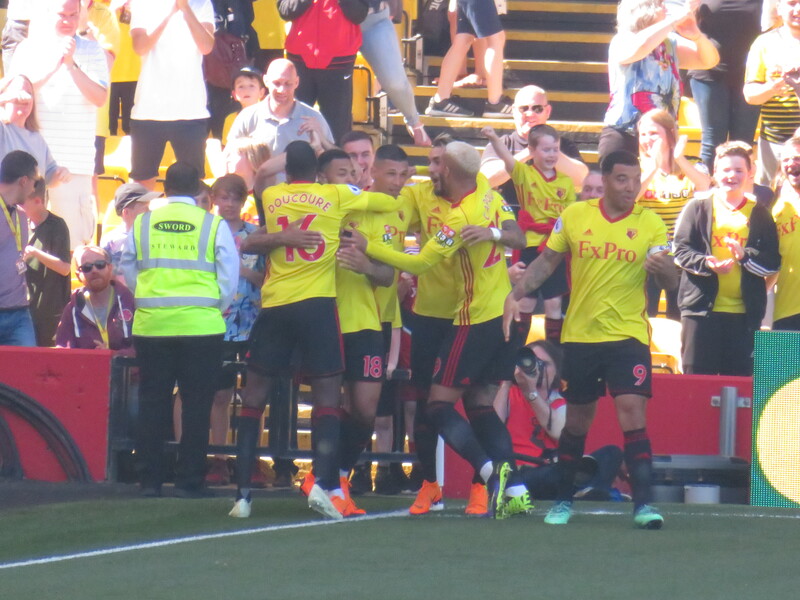 Watford continued to attack as Gray played a through ball to Pereyra, his shot was blocked but rebounded to Deeney, whose shot was also blocked, then Capoue tried his luck and the shot was deflected for a corner, but it was all very positive. Watford continued to dominate, but didn’t test the keeper again until the 26th minute when Capoue won the ball in midfield. He stopped, apparently thinking that there had been a foul, when he finally played on he found Deeney who passed the ball out to Gray on the right, from where he unleashed a terrific shot that Dúbravka did well to save. But Gray wasn’t to be denied for long as he received a lovely cross from Pereyra and headed home to put the Hornets two goals up. Newcastle then had their first chance of note as Gayle played the ball back to Shelvey whose shot was stopped by a terrific block by Doucouré. When Gray broke into the Newcastle box, he appeared to have won a corner, but the lino was flagging frantically and the referee pointed to the spot. Deeney stepped up to take the penalty but hit a low shot that was easily saved by Dúbravka, Troy reached the rebound but, again, the Newcastle keeper denied him. I hoped that we wouldn’t end up rueing that miss, as a third goal would surely have finished the game off. The first booking of the game went to Pérez for kicking the ball away after the home side had won a free kick. So the Hornets reached half time two goals up after a very impressive performance indeed. At half time, the award for the Academy player of the season was presented to Lewis Gordon. Let us hope that he goes on to become a first team regular. The presentation was made by Tommy Hoban, who has had yet another season out due to injury. So sad for such a great prospect and a lovely lad. The final of the half time penalty shoot-out was between Holy Rood and St Pauls. It has to be said that there were some excellent penalties and Holy Rood ran out deserved 4-2 winners. 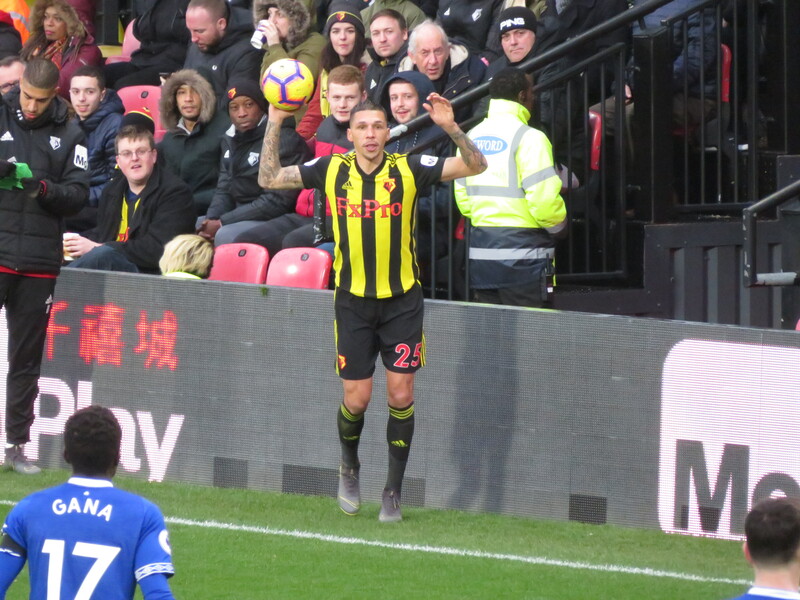 Watford started the second half brightly as a free kick from Holebas was plucked out of the air by Dúbravka. 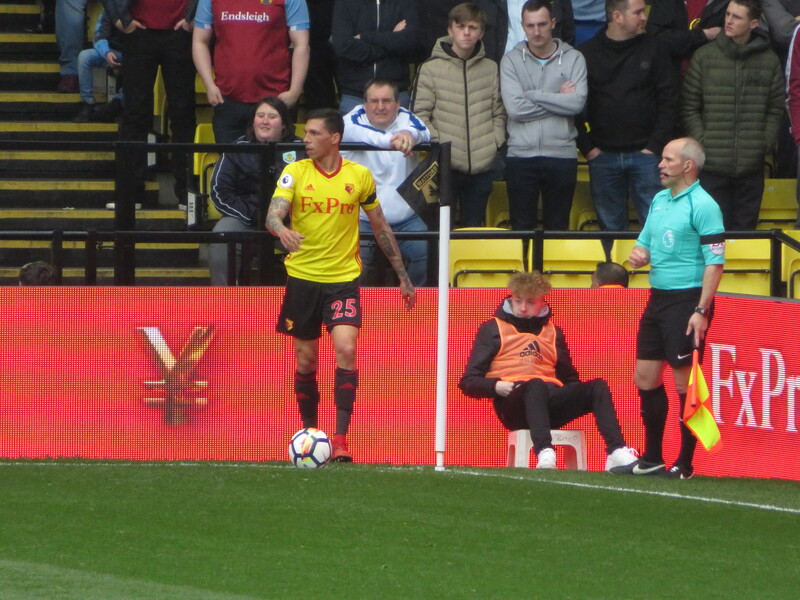 Then Gray’s attempt to latch on to a ball over the top from Deeney was frustrated by a shoulder barge that was deemed fair. The first substitution was made by Benitez as Ritchie came on in place of Murphy. Watford continued to threaten as a free-kick was headed clear to Pereyra whose shot from the edge of the box flew over the bar. The visitors pulled a goal back 10 minutes into the half as a counter-attack finished with a deep cross from Manquillo that was turned in by Pérez. At this point, my pre-match nerves returned with a vengeance. Gracia immediately made a change as Deulofeu replaced Pereyra. The substitution was a little surprising as the Argentine had a great game. The Spaniard had a ropey start, his first action being to pass the ball back to Gayle, thankfully the shot was blocked. The first card for the home side was awarded to Kabasele for blocking a run by Pérez. Deulofeu then played a lovely ball to Gray who cut the ball back from a tight angle, but there was no Watford player there to capitalise. 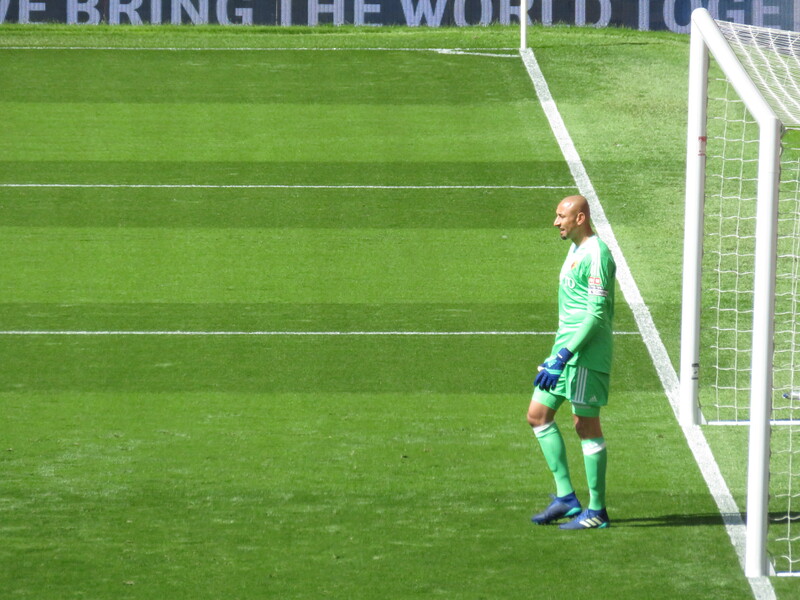 Gracia’s next substitution was even more baffling than the first and was greeted with boos, as he replaced Deeney with Mariappa, which, much as I adore Mapps, seemed incredibly negative with only a goal in the game and half an hour remaining. Mariappa was nearly on the scoresheet at the wrong end as he met a cross from Manquillo with a header that needed a decent save from Karnezis to keep it out. Manquillo was then replaced by Yedlin. Watford’s next goal attempt came from Capoue who tried a shot from distance that was headed out by Dummett for a corner. 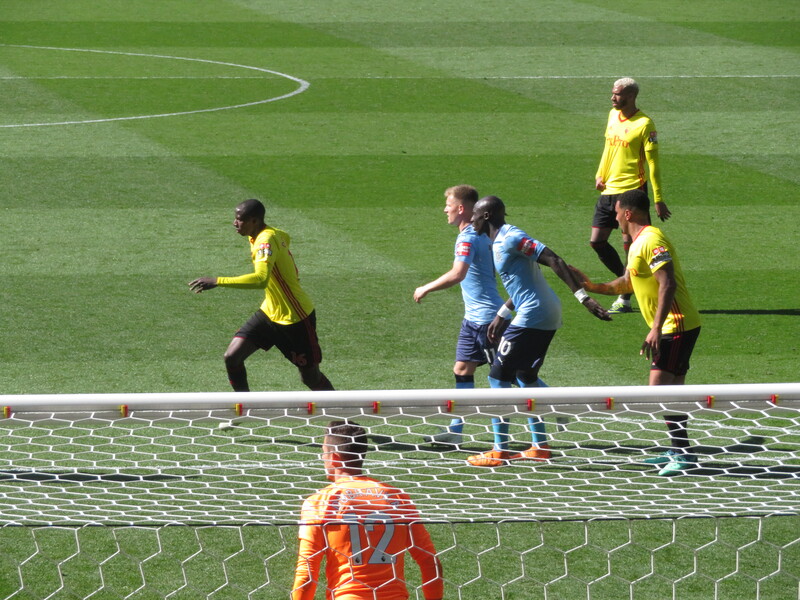 At the other end, there was a worrying scramble in the Watford box before the ball was finally cleared. 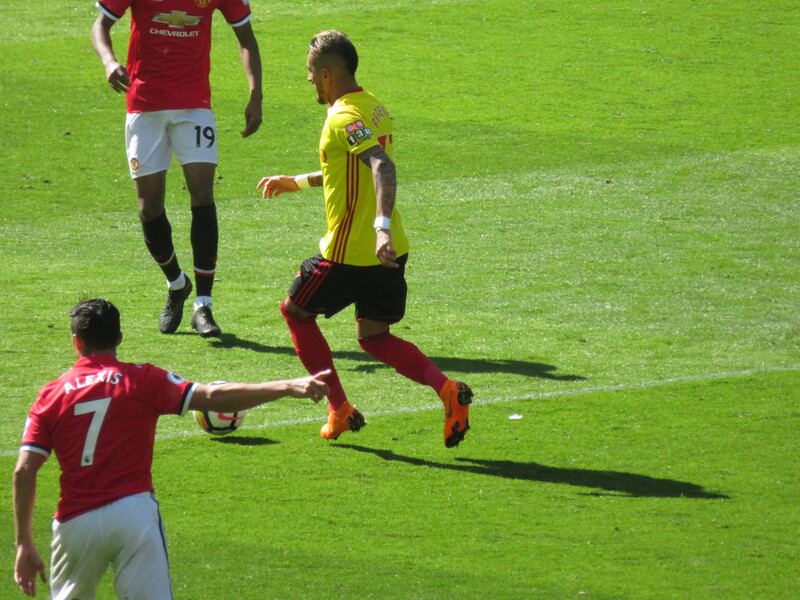 Holebas was the next player to be cautioned after taking too long to take a throw-in. The Newcastle fans thought they had scored an equalizer as, from a corner, Shelvey played a low cross to Pérez but the shot hit the side netting. Gracia’s final substitution saw Gray replaced by Richarlison. 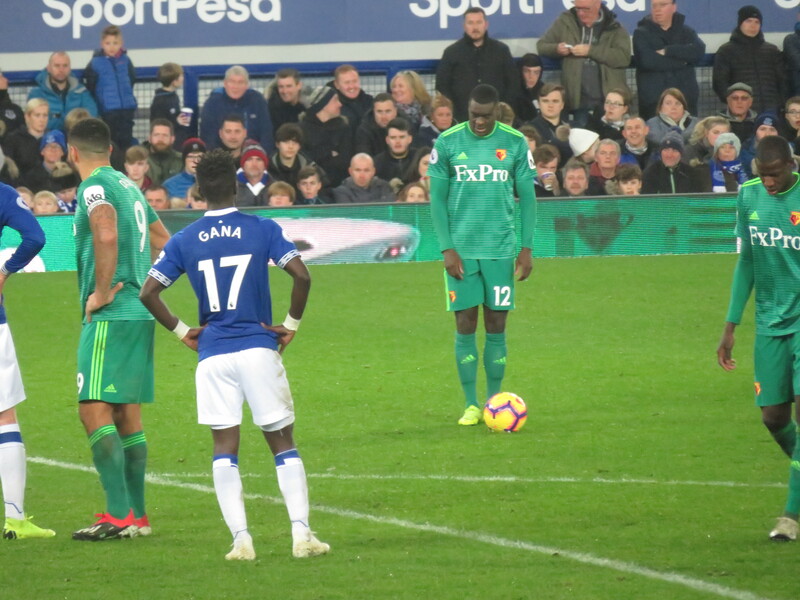 There was a half chance for the Hornets as a free kick from Holebas was met by the head of Kabasele, but the effort was easily gathered by Dúbravka. Then Doucouré appeared to play a lovely through ball for Richarlison, but the young Brazilian broke too early and was flagged offside. The final Newcastle substitution saw Merino come on for Diamé. 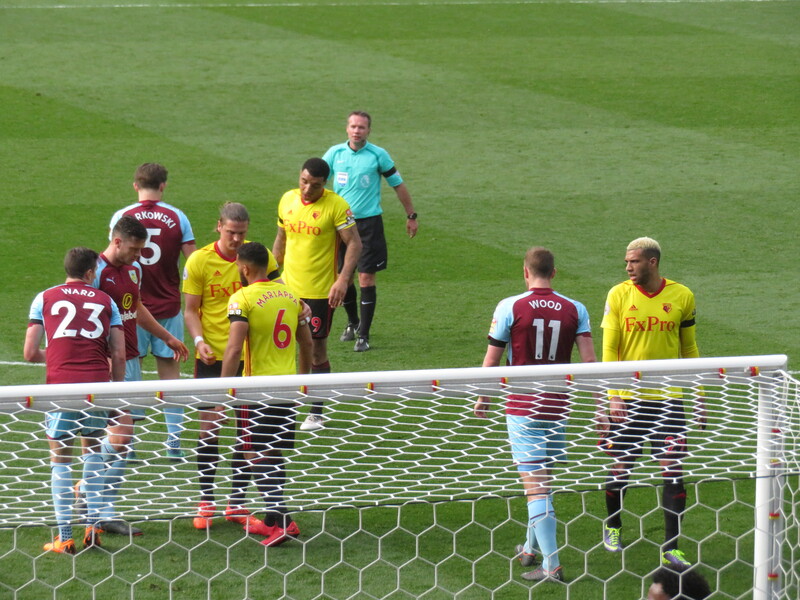 The visitors threatened again as Yedlin went on run down the right wing and pulled the ball back for Merino, but Mariappa made the block to avert the danger. 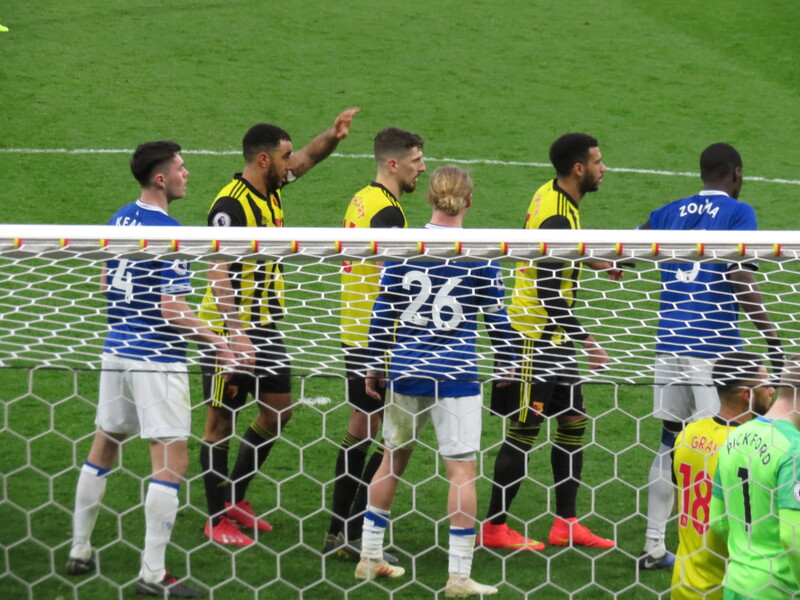 Another decent-looking move from Watford came to nothing as Richarlison broke forward, but his pass was too far in front of Deulofeu and the chance went begging. Into four minutes of added time and we were counting down the seconds as Pérez whipped in a cross that was gathered confidently by Karnezis. Fair play to the Hornet fans at this point as we chanted “Watford FC” with all our might, encouraging our team to hold out as all the play was around the Watford box. Finally the ball was cleared and Richarlison tried to escape and was pulled to the ground. At this point, the referee blew the final whistle and the Watford fans celebrated a win that finally guaranteed the safety that we felt that we had for months. The Watford players all collapsed to the ground. It had been a very hot afternoon and they had given their all. We waited around after the final whistle for the players to do their lap of honour. Knowing that they had guaranteed another season of Premier League football at Vicarage Road, it was all smiles. They then presented a couple of the end of season awards. 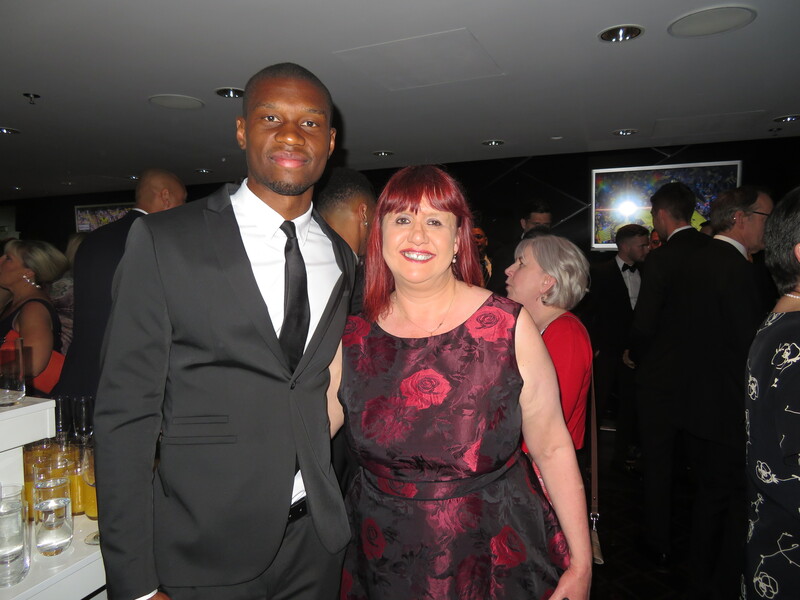 The Community Ambassador award went to Christian Kabasele, whose presentation was slightly delayed as his little ‘un was entertaining the Rookery trying to score a goal. As he carried the ball over the line I reflected that he may be a rugby player in the making. 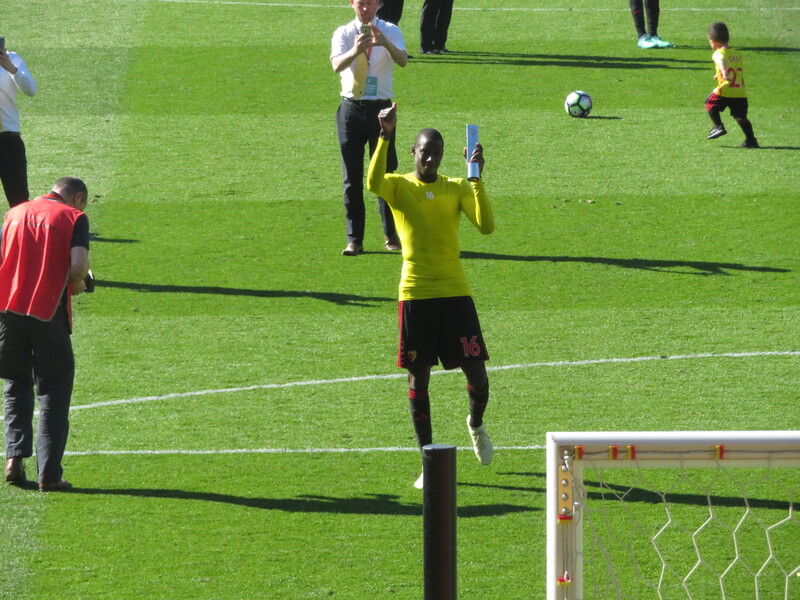 Then the Players’ Player was presented to Abdoulaye Doucouré, a very popular choice who, when given the mic and a bit of encouragement from Tim Coombs, joined in with his song, which was fabulous. So it was back to the West Herts, with a mixture of joy, relief and frustration. That game was Watford’s season in microcosm. A first half in which we played some gorgeous football, were clearly the better team, but missed a penalty when we could have finished the game off. The second half was much more nervy as the players tired and, while they defended decently enough, allowed the visitors too much time in our half so my nerves were in shreds. Again, the opposition scored with their only shot on target. Thankfully, on this occasion, it only affected the goal difference. So I spent the last post-match gathering of the season sitting in the sun with dear friends, reflecting on a win while drinking beer, eating Drummy’s jerk chicken and watching the West Herts cricket team win. Just perfect. This entry was posted in Watford FC and tagged Abdoulaye Doucoure, Adrian Mariappa, Andre Gray, Ayoze Perez, Christian Kabasele, Craig Cathcart, Daryl Janmaat, Deandre Yedlin, Dwight Gayle, Etienne Capoue, Florian Lejeune, Gerard Deulofeu, Jacob Murphy, Jamaal Lascelles, Javi Gracia, Javier Manquillo, Jonjo Shelvey, Jose Holebas, Kenedy, Martin Dubravka, Matt Ritchie, Mikel Merino, Mohamed Diame, Newcastle United FC, Orestis Karnezis, Paul Dummett, Rafa Benitez, Richarlison, Roberto Pereyra, Troy Deeney, Watford FC, Will Hughes on May 7, 2018 by franelynn. As I approached Watford on the train, I could see a huge queue of cars on Waterfields Way. I didn’t take much notice until I saw the traffic at a standstill on both the ring road and Ricky Road. When I arrived at the West Herts, it was very quiet indeed and John, the manager, mentioned that some of his staff were still stuck in the traffic, apparently the result of a fire in the Lower High Street and a domestic incident near Upton Road. Needless to say, Don was in his usual position at ‘our’ table, so we had a good catch up. When the rest of our party gathered, it was time to toast our absent friends, Dee and Toddy, who both had birthdays this weekend. They are greatly missed. Team news was three changes from last week with Kabasele, Holebas and Okaka in for Prödl, Janmaat and Femenía. So the starting line-up was Karnezis; Mariappa, Cathcart, Kabasele, Holebas; Hughes, Capoue, Doucouré, Pereyra; Deeney, Okaka. So Gracia was finally granting many wishes by starting with two up-front and all I could think was that Okaka may breathe on Zaha and all would be lost. 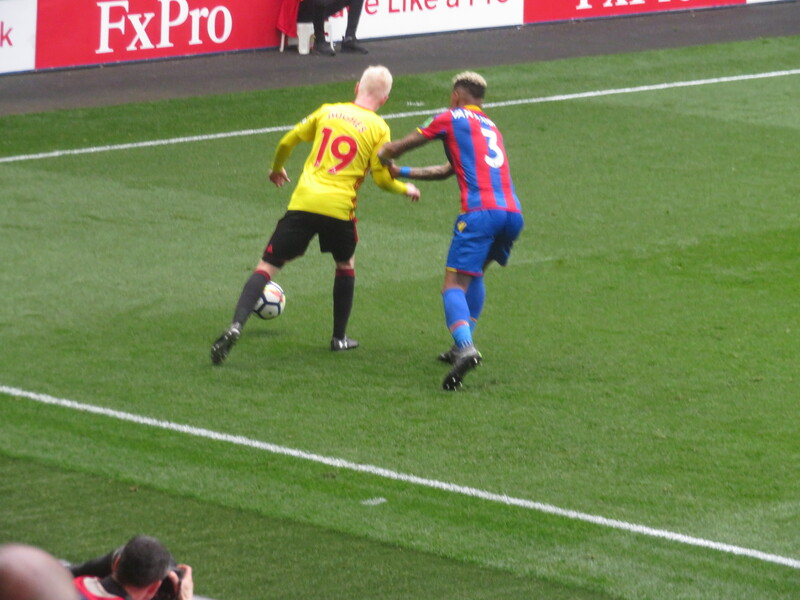 As the teams were announced, young Wilf was given a less than cordial welcome from the Watford fans. In contrast, when Emma welcomed back Ray Lew, our former manager was given a tremendous reception. After the terrible game at Huddersfield, I was hoping that there would be more entertainment on show this afternoon and it all started very promisingly with an early chance for Hughes whose shot across goal flew wide. There was an even better chance a minute later as Okaka met a cross from Deeney with a header that rebounded off the crossbar. The next goal attempt didn’t come until the 19th minute when a cross from Deeney was turned towards his own goal by Ward and Hennessey just managed to get down to keep it out. Ward’s afternoon didn’t get any better as he was booked for a foul on Pereyra. Then, from a corner, Cathcart had two chances to break the deadlock, the first a header that was blocked, the second a shot that Hennessey saved. Watford threatened again as Okaka played the ball back to Pereyra, whose shot was well over the bar. The first booking of the game went to the Hornets as Doucouré was penalised for a foul on Loftus-Cheek. Palace’s first shot on goal came after 34 minutes as a free-kick was met by Tomkins, but his downwards header gave Karnezis an easy save. This incident was missed by a couple of guys who had taken seats in the row behind us and were clearly not Watford fans. When challenged, they claimed to be scouts who had been given seats at the front of the Rookery and had moved back so they could get a decent view. It sounded improbable and, soon after, they were invited for a chat by a couple of stewards and we didn’t see them again. 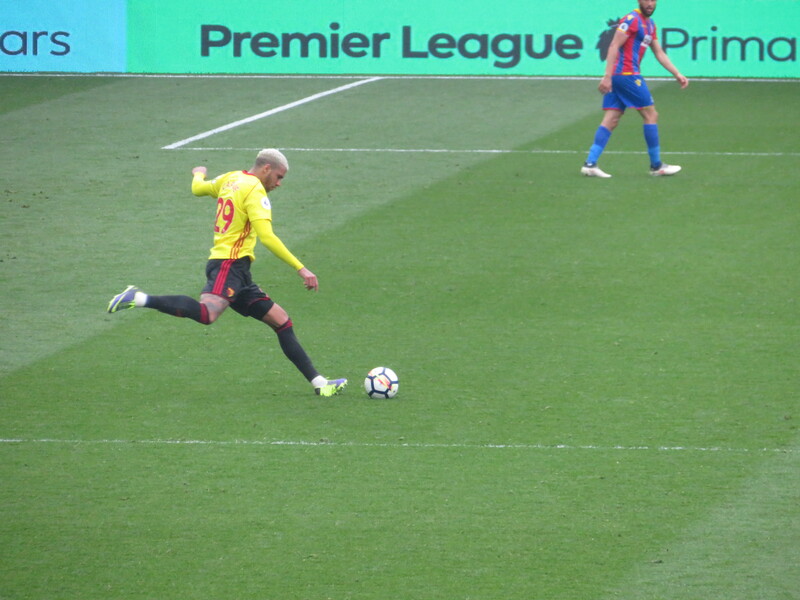 Back to matters on the pitch and a corner from Holebas was met by a Palace head, the clearance fell to Hughes who shot over the bar. Late in the half, Zaha made his first run into the Watford box with Kabasele challenging, so the Palace man, inevitably, went down. 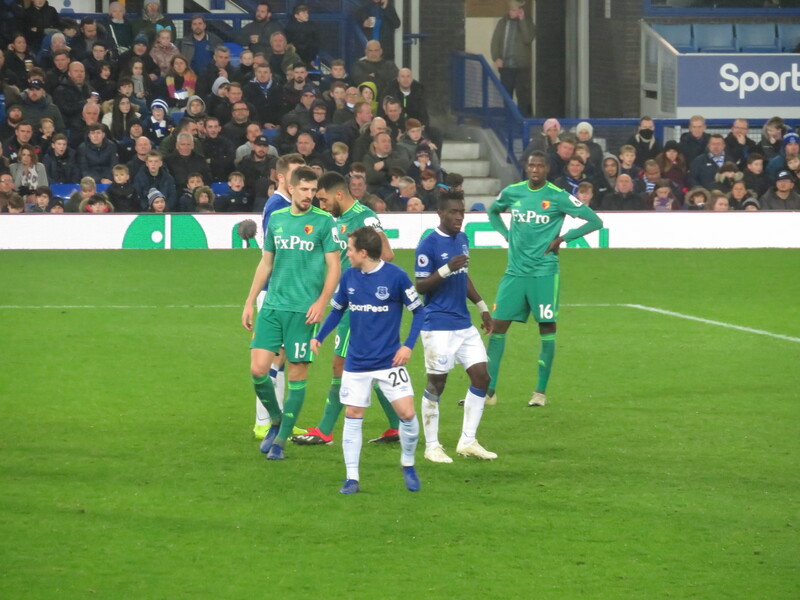 The referee waved his appeals away, but Doucouré reacted with fury, pushing Zaha, and was very lucky not to get a second yellow for his trouble. As the clock reached 45 minutes, Deeney played a one-two with Okaka, before trying a shot through legs that ended up being an easy catch for Hennessey. The final chance of the half came from a long throw that found its way to Mariappa whose shot was deflected wide. At half time, there was an interview with Jóhann Gudmundsson , whose time in a Watford shirt had been completely forgotten by all around me (my excuse was that I was living in the US at the time). There was also a parade of young players from the various Watford Ladies age groups, who were given a tremendous reception. The first action of the second half involved Zaha who, while going for a ball in the box, kicked Karnezis in the stomach. It was a nasty tackle and, needless to say, the Rookery were shouting for him to be sent off. The referee decided that a talking-to was sufficient, which seemed very lenient. 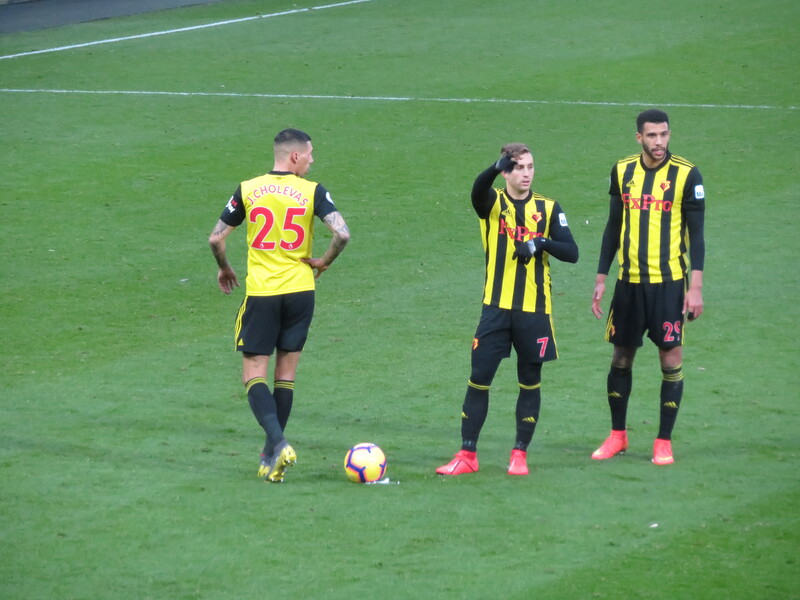 The first substitution was enforced as Pereyra picked up an injury and had to be replaced by Richarlison. It was a great shame to see the Argentine leave the field as he was having another great game. There was then a booking for Mariappa for a slight pull on Zaha’s shirt, which seemed rather harsh after Wilf’s assault on Karnezis went unpunished. Palace then had their best chance so far after Zaha was tripped on the edge of the box. 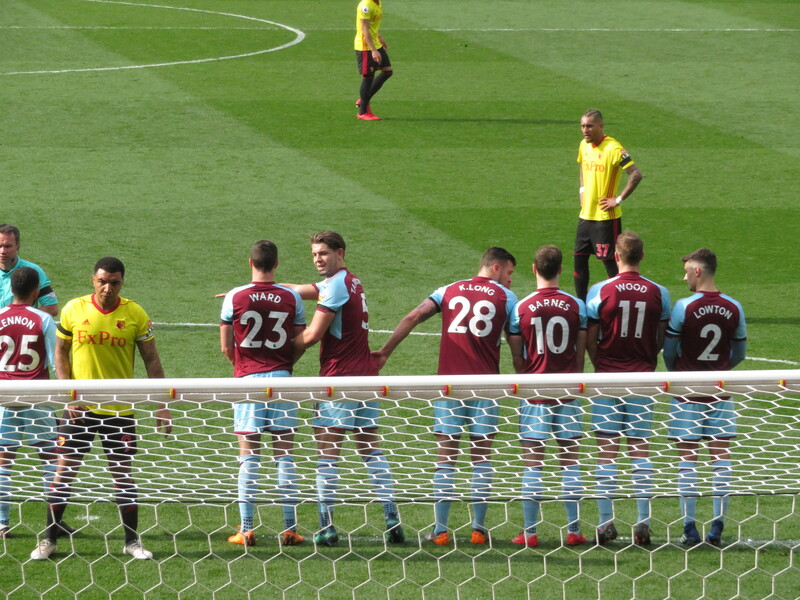 Milivojević stepped up to take the free kick and it rebounded off the crossbar then bounced around the Watford box until Karnezis was finally able to clear. Zaha went on another run into the Watford box, before falling … again. When the referee blew his whistle, my heart sank, until he pointed back up the pitch and booked Zaha for simulation. At this point, I celebrated as if we had scored. Ironically, Wilf had a good shout for a penalty on that occasion, but he goes down so easily and so often, always looking for the foul, that he tries the patience of referees as much as of opposition fans. 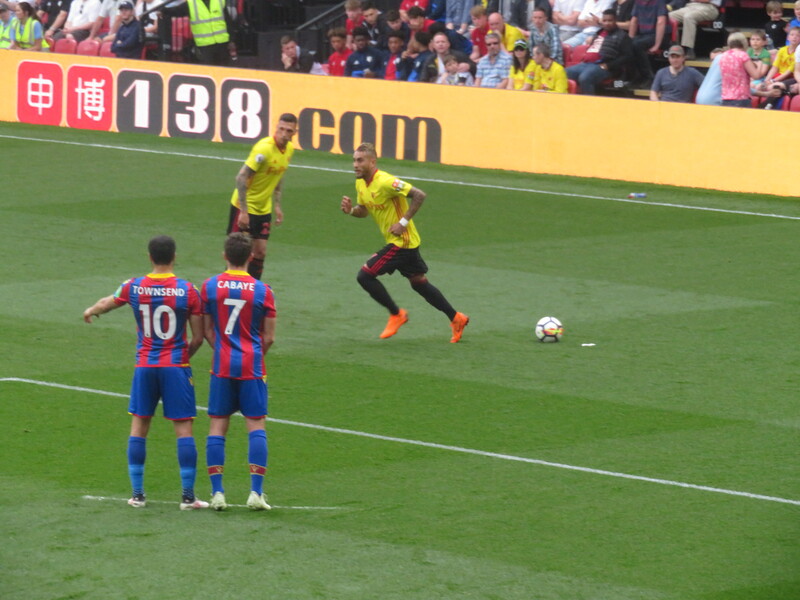 Palace looked sure to take the lead from a corner, as a Tomkins header hit the post, the rebound dropped for Sakho in the six yard box, but Deeney was on hand to clear before the Palace man could make contact. With 20 minutes to go, Gracia made his second substitution, replacing Okaka, who had a decent game, with Femenía. Watford continued to threaten as Hughes played Richarlison in, the young Brazilian’s first shot was blocked, his follow-up curled wide of the far post. 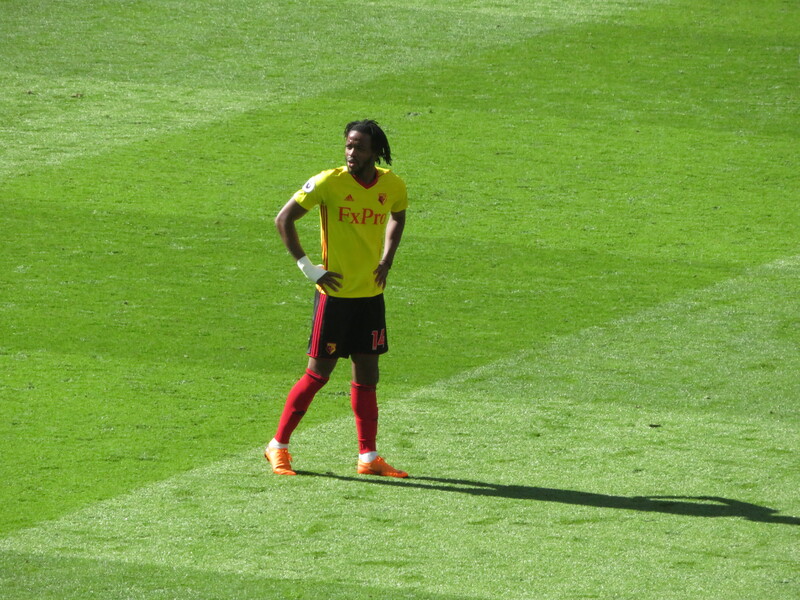 Watford’s final change saw Gray come on in place of Hughes. 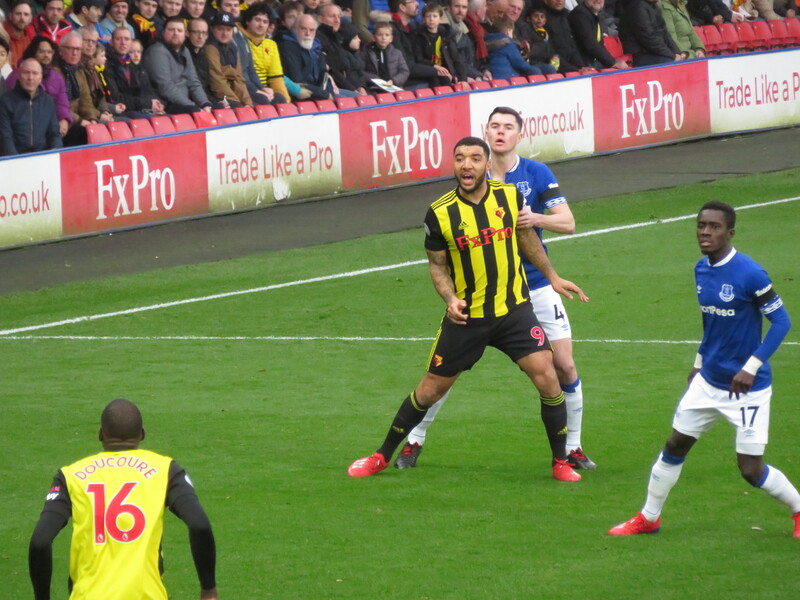 The home side had another good chance as Deeney played the ball out to Richarlison whose shot needed a decent save from Hennessey to keep it out. Deeney then tried a shot from a good position, but didn’t quite catch the ball right and it went over. Palace made their first substitution with 10 minutes to go, bringing Benteke on for McArthur. But Watford had the next goal attempt as Richarlison tried a looping shot that was easy for Hennessey. The youngster then intercepted the ball in midfield and tried to release Gray, but the pass was just too long. There were two late bookings as Tomkins was cautioned for a foul on Richarlison and Cathcart for stopping Zaha. Palace’s last chance to grab the points came when Zaha crossed for Townsend whose header was wide of the target, but the flag was up for offside anyway. 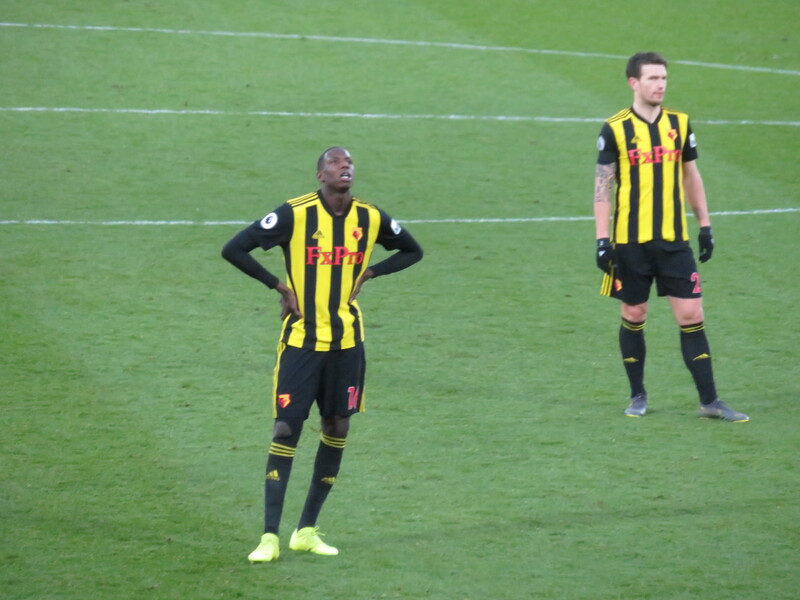 Watford had one final chance in time added on when they won a free-kick on the edge of area, but the delivery from Holebas rebounded off the wall and the game finished goal-less. As 0-0 draws go, that was actually an entertaining game. Both teams were up for it and Watford completely dominated the first half before a fairly even second period. Palace are always tricky opposition and have a good record against the teams in the bottom half, so I was happy with a point, especially as that deprived them of a further two as they tried to catch us. There were some good performances. Pereyra continues to impress and gave Ward a torrid time on the wing. As with Cathcart last week, Kabasele impressed on his return, so I look forward to him entertaining on the pitch as much as he does on Twitter. The two up front led to us creating more chances and Okaka had one of his good games, but he blows so hot and cold that you never quite know what you will get from him. As for the pantomime villain of the day. I was interested to hear Roy Hodgson on MotD saying that rumours that Zaha is a cheat lead to the crowd’s reaction, completely missing the point that we have witnessed his gamesmanship over many years. I can’t bear him. Players do not gain a reputation like that without reason. Well, with 3 games to go Watford are still mid-table and, if they continue putting in battling performances like that, I will finish the season with a smile on my face. This entry was posted in Watford FC and tagged Abdoulaye Doucoure, Adrian Mariappa, Andre Gray, Andros Townsend, Christian Benteke, Christian Kabasele, Craig Cathcart, Crystal Palace FC, Etienne Capoue, James McArthur, James Tomkins, Javi Gracia, Joel Ward, Jose Holebas, Kiko Femenia, Luka Milivojevic, Mamadou Sakho, Orestis Karnezis, Patrick van Aanholt, Ray Lewington, Richarlison, Roberto Pereyra, Roy Hodgson, Ruben Loftus-Cheek, Stefano Okaka, Troy Deeney, Watford FC, Wayne Hennessey, Wilfried Zaha, Will Hughes, Yohan Cabaye on April 22, 2018 by franelynn. After my complaints last week about the ticket office being unhelpful in our attempts to renew my niece’s season ticket, I am pleased to report that, thanks to help from Richard Walker and Dave Messenger, it was all sorted out on Monday and Amelia has secured her seat for next season. On to this Saturday and I left London ridiculously early, taking the 8:33 out of King’s Cross. This proved to be a very good decision as the train an hour later was subject to long delays that would have severely restricted my time in what was a fabulous pub. 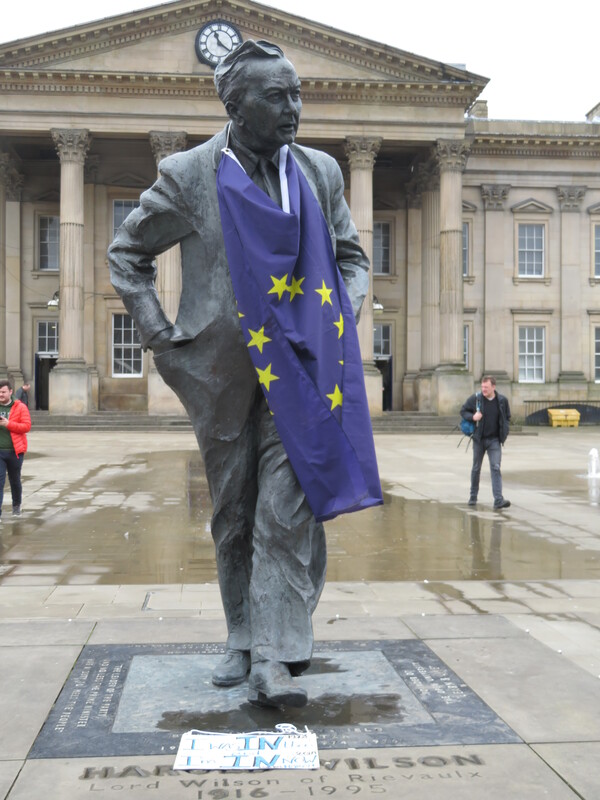 After a pleasant journey, I arrived to find Harold Wilson in the square outside the station draped in an EU flag with a placard declaring his support for continued membership. It was then a short walk to the pre-match pub where the beer was fabulous and the pies were superb. I chose the moo and blue, which was as meaty and cheesy as you could wish for and accompanied by lovely, thick, caramelised chips, peas and onion gravy. Others in our party who tried the goat curry pie were equally fulsome in their praise of the food. The pub was also hosting an “At Your Place” event, which was packed out and, by all accounts, went very well. A special treat for the NE/NW/Yorks Hornets was the presence of Tony Coton, who came and said hello to us afterwards. He looked unsure about leaning across a table full of beer glasses to give me a kiss, but I wasn’t taking no for an answer. The walk to the stadium was everything I love about that time before the game. As the crowds merged, there was that sense of anticipation that builds when you don’t quite know how the afternoon will pan out. When we arrived by the away turnstiles, we found a huge queue in front of us, but, thankfully, we were soon through security and took our seats just in time for kick-off. Team news was the very welcome return of Cathcart in place of Holebas, who had taken a knock during the week. 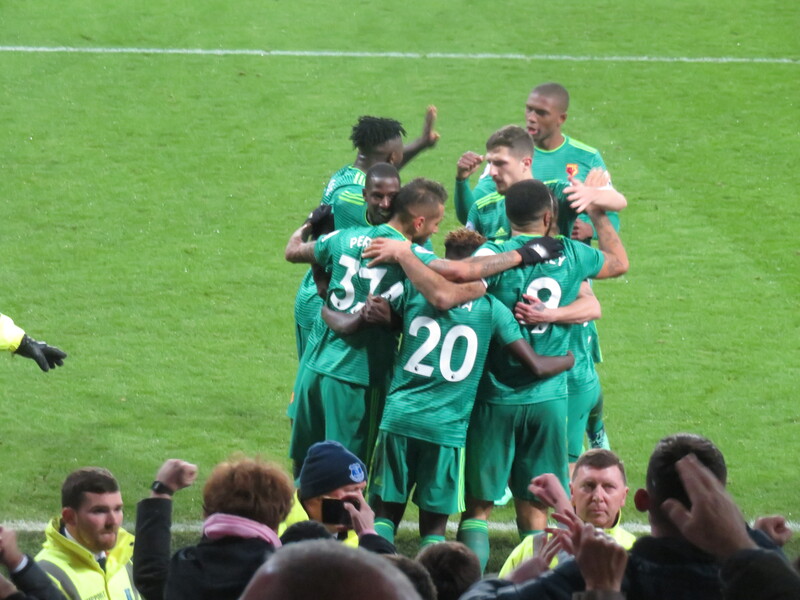 Otherwise, the Hornets were unchanged from the last game, so the starting line-up was Karnezis; Mariappa, Prödl, Cathcart, Janmaat; Doucouré, Capoue; Femenía, Hughes, Pereyra; Deeney. Huddersfield was captained by former Watford hero, Jonathan Hogg, who certainly still has a place in my heart. The game started with the home side dominating possession, although the first goal attempt didn’t come until the 18th minute when, from a corner, Mounié headed the ball down for Quaner, Karnezis managed to block the shot, but the flag was up for offside anyway. 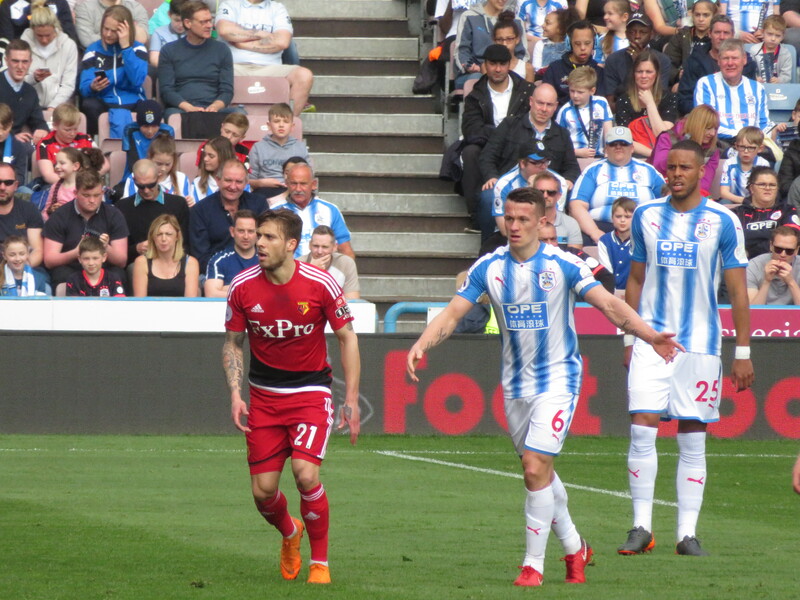 The Terriers had another chance soon after as van La Parra crossed into a danger area, but Janmaat was on hand to put the ball out for a corner just before being booked for an earlier foul on Mooy. Watford’s first real attack came in the 27th minute when they won a corner, but Pereyra’s delivery was poor and went straight out of play. The visitors followed up with a nice passing move, but it finished with a wayward shot from Deeney that was deflected for a corner. Again the delivery of the set-piece by Pereyra was dreadful and the ball flew out of play. It was not the Argentine’s day as he made an attempt to rescue a ball, fell while challenging and was booked, apparently for simulation, which seemed odd as, from my vantage point, he just appeared to have missed a tackle. Pereyra redeemed himself by playing a lovely pass to Doucouré but the shot was straight at Lössl in the Huddersfield goal, so was easily saved. 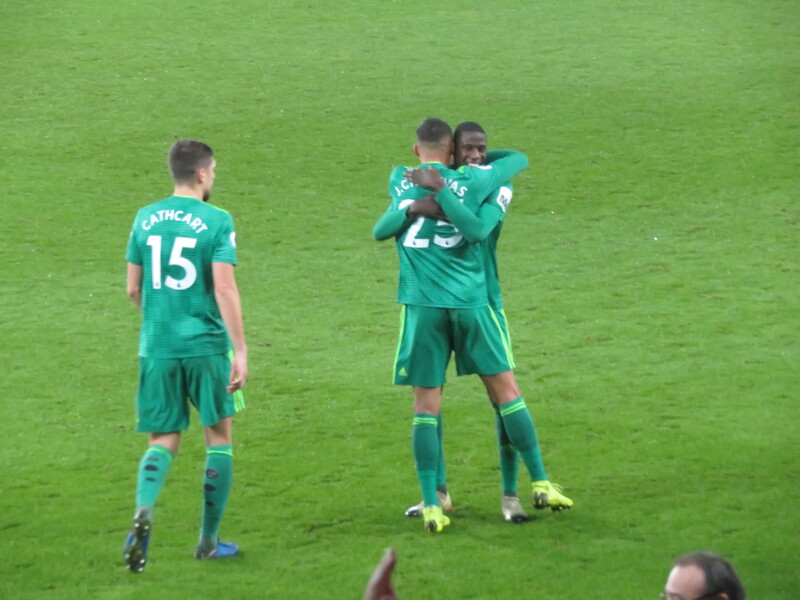 A Pereyra free-kick was pounced on by both Deeney and Doucouré, they seemed to get in each other’s way, but the skipper touched it on and Abdoulaye managed a shot that was deflected into the side netting. That was the closest that either side came to a goal in a half in which the final action was a booking for Zanka for a trip on Pereyra. It had been a strange first half, there was a lot of running with very little in the way of either goalmouth action or quality. Huddersfield had dominated possession but had yet to test Karnezis. The second half also started slowly, the first action of note being a free kick that was played short to Hughes, but his delivery was poor and flew wide of the target. Each side made a substitution around the hour mark. First Femenía made way for Richarlison. Then Ince came on for Quaner to boos from the travelling Hornets. The visitors had a decent looking chance (at least in the context of this game) as Deeney played in Hughes but, while trying to avoid challenges, he was unable to get a shot in and the ball rolled through to Lössl. There was a half chance for the home side as a shot from Mounié was blocked by Doucouré. Then van La Parra tried his luck with a curling shot that was well wide of the target. Huddersfield made their second change bringing Depoitre on for Mounié. From the other end of the ground, I was a little concerned when Pritchard went down under a challenge from Prödl, but the referee adjudged that the Huddersfield man had played for the penalty and booked him. With about 10 minutes remaining, each side made a substitution with Billing on for van La Parra and Deeney making way for Gray. The home side had a chance to take the lead almost immediately as a defensive header from Prödl reached Hogg, whose shot was just wide of the far post. At this point, there was an ironic chant of “This is the best trip I’ve ever been on” from the travelling Hornets. Gracia’s last roll of the dice was to replace Hughes with Sinclair. But it was the home side who made the breakthrough in time added on with a goal out of nothing. 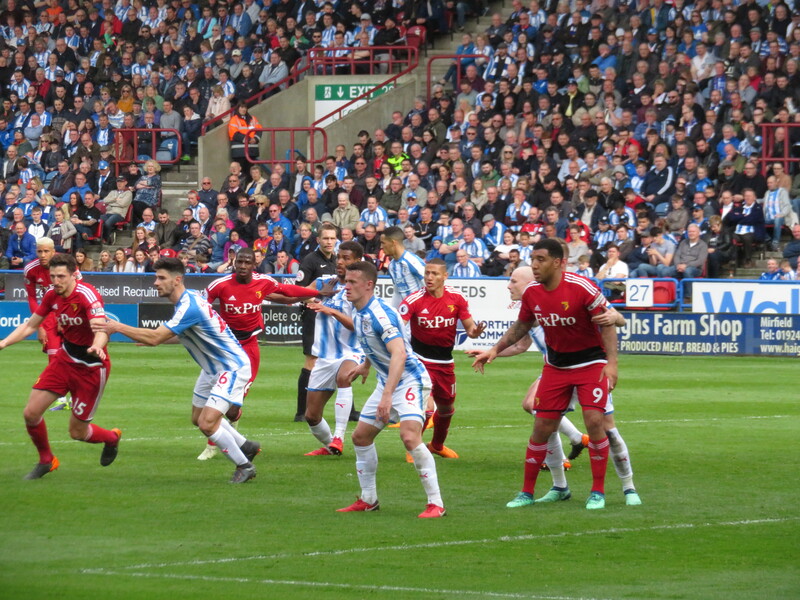 A ball was launched into the Watford box, Karnezis came across to gather but Zanka pulled the ball back and Ince was on hand to finish into an empty net with Huddersfield’s first on-target shot of the game. So frustrating. 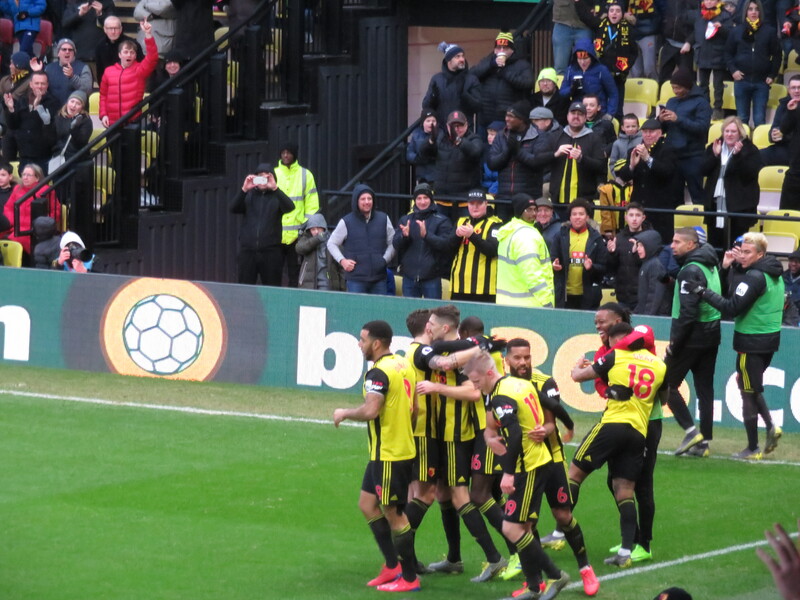 The Hornets tried to hit back as a shot from Prödl was blocked leading to a Watford corner, but Lössl leapt to gather the delivery and the home side won all three points at the death. At the final whistle there was a joyous roar from the Huddersfield fans, who had been very loud in support of their team throughout the game. I was happy for them, but couldn’t help but contrast that with the tears of two young Watford fans who were sitting near me. Sadly we are having yet another season where we finish with a whimper and (hopefully) stay up due to sterling efforts in our early games. I find myself looking forward to mid-May when it will all be over. But I can’t help hoping that we still have something more to cheer this season. Otherwise, the pies had better be cracking over the next month. This entry was posted in Watford FC and tagged Aaron Mooy, Abdoulaye Doucoure, Adrian Mariappa, Alex Pritchard, Andre Gray, Christopher Schindler, Collin Quaner, Craig Cathcart, Daryl Janmaat, David Wagner, Etienne Capoue, Florent Hadergjonaj, Huddersfield Town FC, Javi Gracia, Jerome Sinclair, Jonas Lossl, Jonathan Hogg, Kiko Femenia, Laurent Depoitre, Mathias Jorgensen, Orestis Karnezis, Philip Billing, Rajiv van La Parra, Richarlison, Roberto Pereyra, Sebastian Prodl, Steve Mounie, Terence Kongolo, Tom Ince, Troy Deeney, Watford FC, Will Hughes on April 15, 2018 by franelynn.